Bas-reliefs at Willow Lake Clubhouse at Parkview Hills – an environmentally-oriented community Burt and Dr. Batts founded. 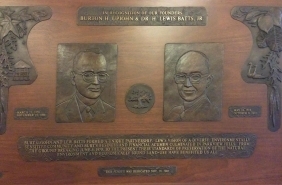 Burton Upjohn and Lew Batts formed a unique partnership. Lew’s vision of a diverse, environmentally sensitive community and Burt’s business and financial acumen culminated in Parkview Hills. From the groundbreaking June 5, 1970 to the present their standards of preservation of the natural environment and economically sound land -use have benefited us all.